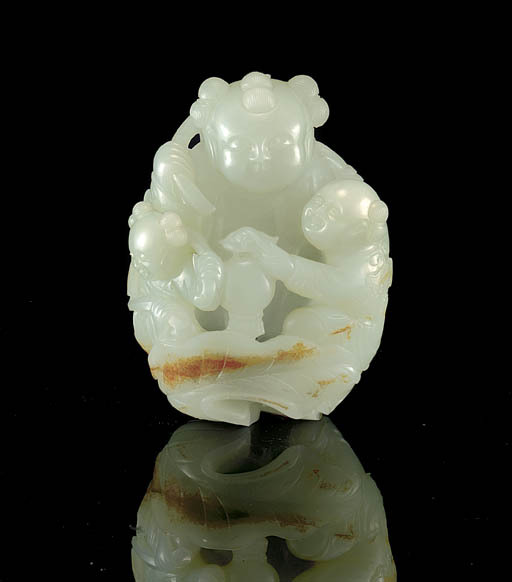 The depiction of children, and in particular, boys, can be found in various media in Chinese art including painting, porcelains, lacquer and jade carvings. They symbolise a wish for many children, but more significantly, many sons. The stalk of millet in the present carving plays on the pun for he, meaning harmony, and this theme is reinforced by the inscription on the cash-coin, which itself represents wealth. In total, the motifs here encompass many auspicious themes, making the piece a very appropriate wedding or birthday gift.